Station 3 was to record the number of rolls it took to get 6 of a kind in ** Motion-X Dice**. We had done this before, just collecting data and then looking at that data. Today’s twist was to predict how many rolls it would take and then calculate the variance between their prediction and the actual count. To introduce this task, I put a three column chart on the board labeled P, A and V. (I use T-charts all the time as organizers in my classroom, so adding a column is nothing the kids haven’t seen before.) As I introduced the chart, I told them that today we were not only going to record the actual rolls of the dice, as we have done before but we were going to calculate something called “variance.” I then pointed to the chart and asked what they thought the V meant. Of course they said variance, and I said I would tell them in a minute what variance meant in this case. Then I asked about the P, thinking they would immediately say prediction, even though I hadn’t pre-loaded that word into the conversation. I can’t remember everything they guessed, but the third or fourth guess stuck in my head, and that’s when I told them it was prediction. One kid raised his hand and said, “PRAY?” I laughed and said, “Explain that, please,” and he responded, “We pray to roll the same six numbers really quickly?” At that point I named “P” for prediction and A for “actual,” then gave a few examples, to make sure they not only knew how to fill in the table, but understood that the variance could be positive or negative. I have never taught negative numbers to these kids, although their classroom teacher has done a quick one day lesson, and many of their parents have told me they have worked with negative numbers because their child asked. However, math just makes sense to these kids, so I don’t worry about them not having prior information–I give them enough to figure the patterns out and they usually do. 1. I wanted to see if they were indeed calculating the variance correctly and if they “got” negative numbers. 2. I was looking to see if predictions were even close to the actual number of rolls. What I saw surprised me in some ways. First, there were a couple of kids whose predictions matched the actual count perfectly at least once. Generally the variance was fairly low, which told me the kids had figured out some patterns in the rolling, and gave me fodder for the next class’ conversation. I was surprised the variance was as low as it was in many cases and was anxious to ask what they were basing their predictions on and what patterns they were looking for in their work. The kids whose variance numbers were larger were doing things like holding the iPod differently as they shook it, or talking to the iPod as they rolled it, or attaching some ritual to the act of rolling the dice (much like some people blow on the dice before they roll for good luck.) That told me some people were believing, at some level, luck (or chance) could be manipulated, and again, gave me info to use in the next conversation. While I didn’t initially think this station was as powerful as the others, when I went to observe (and then to reflect here) I realized there was lots to be gained by asking kids to do a similar activity again, with just a small twist. Only one child needed support to understand negative numbers, they all were predicting, couting and recording accurately, and talking to one another about their results as they worked. PLUS, I found out that despite our work on probability this year, there were a few kids who were still believing they could manipulate chance to improve their results. 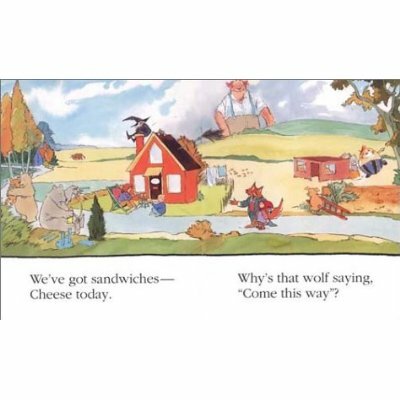 The other thing that struck me (AGAIN!) was the motivation they had to predict, shake, record and reflect on their results on the iPod. The tool is virtual, there is no noise (unless they turn the volume up), but they worked the entire time at this station, doing something they KNEW how to do from prior experiences. Once again, the iPod Touch motivated them to stay engaged and involved in the learning task. The tool here provides an avenue for learning that allows them to gather data quickly, and easily see results. The tool here engages the student. AND, the tool here entices the kids to stay engaged. iPod Touches should be in EVERY classroom! I used them as conversation starters–if a kid was running down the hall, I could ask either “are you being safe?” OR “Could your running be bothering others in classes who are trying to learn?” if a child hit another one, I could ask “Are you being considerate?” Getting a kid to OWN and name their behavior is a critical step to getting them to talk about it and make a plan for changing it. I didn’t accuse them or fuss at them, simply asked if they were following our class rules. Asking questions is a great way–IF THEY ARE THE RIGHT QUESTIONS–to get kids to think–about behavior as well as the world around them. I believe in teaching kids to think, so when I taught Kindergarten, I would often play with them with language–if they asked “can I go to the bathroom?” I would respond, “I don’t know, can you?” They soon learned to ask “May I go to the bathroom?” I would then respond, “Of course you can, you don’t have to ask.” (We had a bathroom in our room.) They soon learned to just go when necessary. Or, when a child would come up and say “Can I ask you a question?” My response would be “Of course not, You’re not allowed to ask questions in school.” Some little ‘uns would then turn to walk off. . . .(I would catch them) but some would stand there a second and look at me, pondering what to do. I would tease them a few more sentences worth and then let them ask their question. . . but what happened is that they began paying attention to how they phrased questions and thinking about my responses. I would give silly answers whenever I could–especially to questions they already knew the answer to, so they would say “No, that’s not right.” I could then ask them why they asked me if they already knew the answer. My goal was to get them to think and engage the other person thoughtfully. The next year I moved to another school and again taught Kindergarten. In that school, I had another child, Joseph, say almost the exact same words–“Ms. 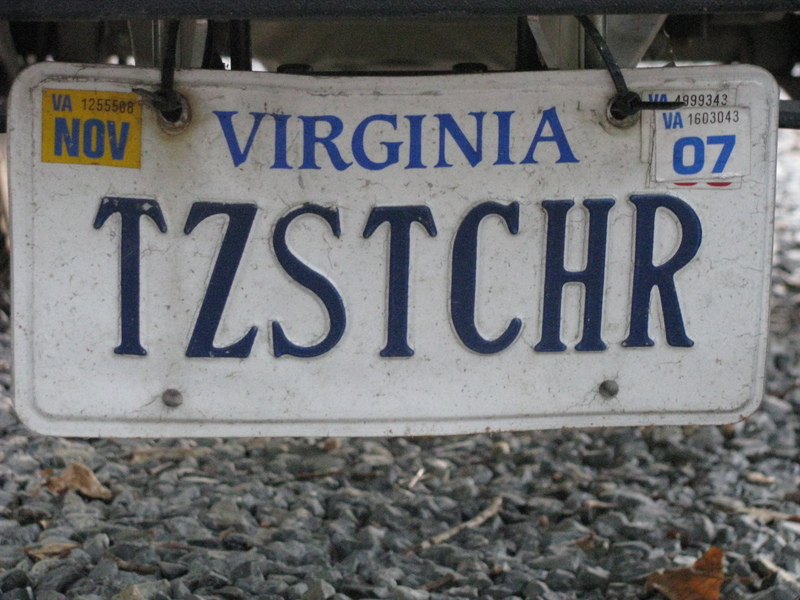 White, you’re the teasiest teacher in the whole world!” At that point I knew what my vanity license plates would be and promptly ordered them–VA license “tzstchr”. The name has stuck, and when I began a blog, I knew that had to be the name of it.